This soup is g-double oh-d! GOOD! 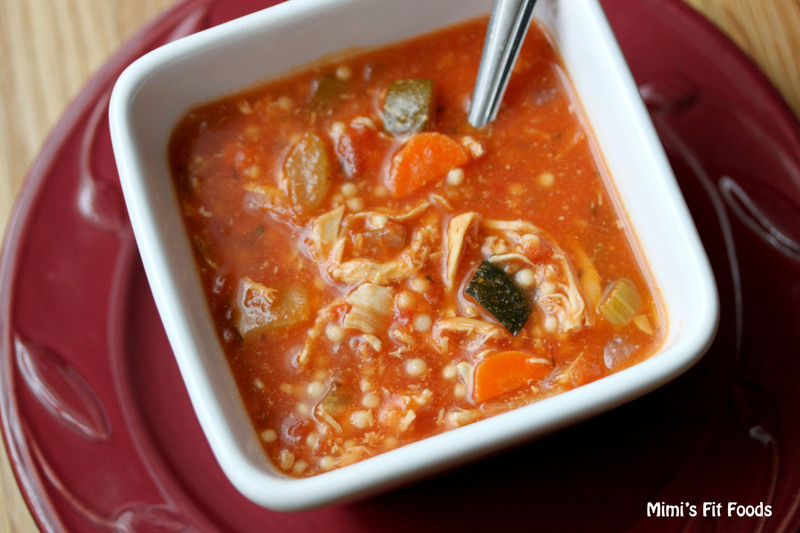 I love me some good soup whenever there is a chill in the air, and this soup just jumped into my favorites category. I love tomato based soups, and this one is awesome. I created this recipe from a version I found on another food blog and I figured it had to be tasty because it was a remake of a favorite soup from their favorite Italian restaurant (D’Amico & Sons). It took me all of two seconds to plan to make it with my own healthy twist. I’m so glad I did because Beau and I looooooved to eat this and we loved the leftovers even more (the pasta soaked up more flavor as well as some of the broth, so we just added more broth to take it back to a soup-like consistency)! I’m already planning when to make it next. All I know is it’s gonna be soon! In a large pot add olive oil and saute onions, celery, and carrots over medium high heat for 8-10 minutes. Add zucchini and garlic. Saute until tender about 4-6 minutes. Add chicken stock, tomatoes, basil, oregano, chicken. Simmer soup for 20 minutes, vegetables should be tender. Add the pasta and cook right in the soup for another 10 minutes. Season with salt and pepper. Made this soup last night. Every one LOVED it! I have a family of 6 so I double the recipe so we’d have left overs. I didn’t have any crushed tomatoes, so I used Italian stewed instead. I chopped them up so there wouldn’t be any large chunks. My 16 yr old son said “this is going to be awesome for lunch tomorrow”. I have to agree! Can’t wait to eat the left overs for lunch. Thanks for a great recipe Mimi!